Every time I ask OsirisOrion to participate in a project I'm involved in, he brings me world-class work. 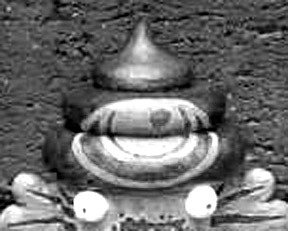 Above is a poorly-veiled image of one of OsirisOrion's custom Mini Kaiju Cupcakes done for our collaborative blind-box custom series we're putting together with Rampage Toys. 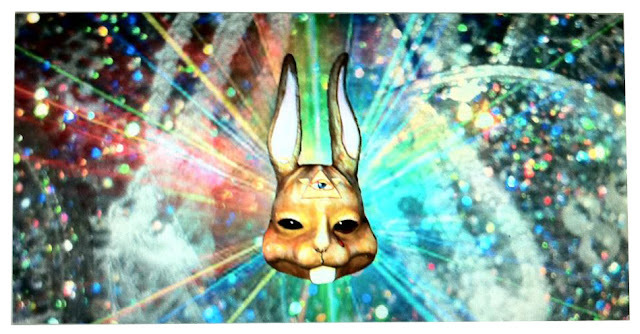 To recap: the artist roster is OsirisOrion, Nasty Neil, NREAZON, Justin Hillgrove and Jon Malmstedt. The pieces are about 2 inches tall, and the resin platforms were hand-crafted by Jon Malmstedt. Each custom will retail for $35. There are 25 blind-boxed pieces in this series, with one Golden Ticket randomly inserted. 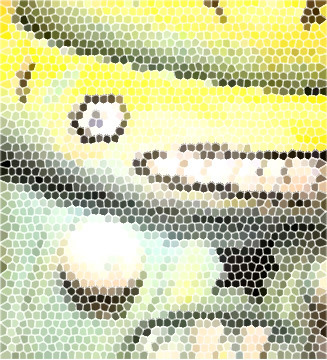 We have one more teaser to tease you with (NREAZON) and then we'll start promoting the release next week! Release date TBA soon. This release will take place on the Tenacious Toys website. Kaos the Klown Munny custom by B.A.L.D. B.A.L.D. 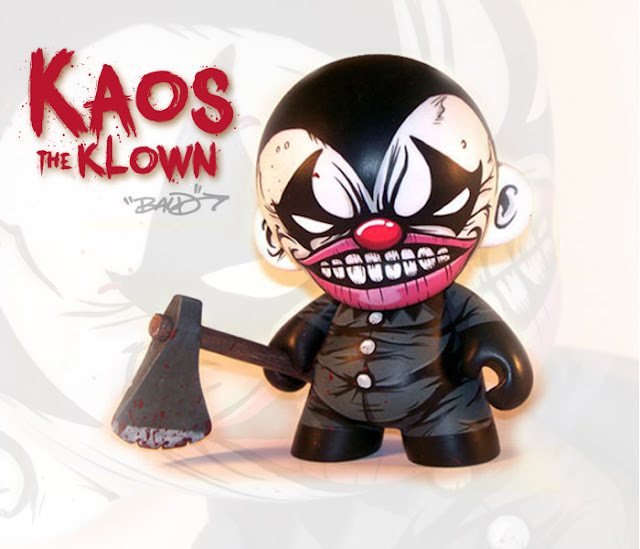 shares with us more of his finely crafted custom work: this is a 7" custom Kidrobot Munny titled Kaos the Klown. He comes with a custom axe accessory and he's for sale in the CTU store here, along with several other customs by B.A.L.D. and other CTU artists. Nice work! 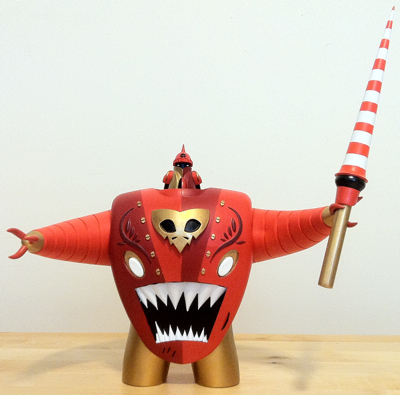 Halfbad Toyz: Smash Tokyo Toys X Halfbad Toyz reveal! "Look for these to be released real soon with Smash Tokyo Toys. They will be insanely limited...."
These awesome 6-inch resin robot figures are a Smash Tokyo Toys design, brought to life in the mad CT laboratory of Halfbad Toyz! Warning: I WILL be gunning for an exclusive colorway run of these figures. It's not set in stone yet but Halfbad and I will be talking soon about that. Our last collab with Halfbad was a Pearl White run of their Skekiltor figure, and although I'd like to stay consistent, I am aware that Halfbad has a variety of resin color/tint options that they can use. I am open to colorway suggestions! 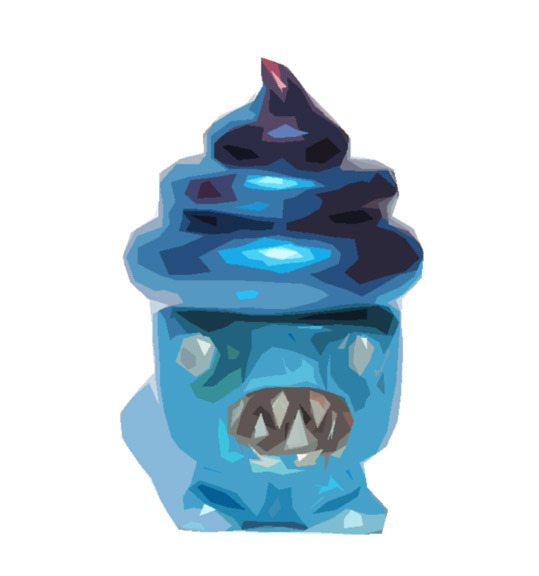 Today's teaser is one of Nasty Neil's custom Mini Kaiju Cupcakes, which he dubbed the "Illuminati Swag Demons". Nasty Neil is the force behind I Will Not Be a Wasted Talent- a true renaissance man, Neil works in music, art and fashion. On any given night, he might be creating beats, crafting jewelry, customizing toys, smoking blunts, tweeting about girls who wear Uggs, or wandering around Manhattan. Or all of the above, at the same time. He's dangerous. Full reveals of Neil's customs, more teasers and more info on this Rampage Toys x Tenacious Toys series to be released soon. 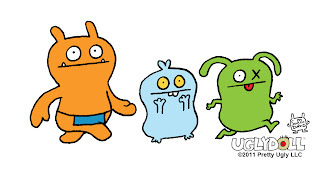 Illumination Entertainment chief Chris Meledandri has acquired rights to turn the Uglydoll franchise into an animated feature film. 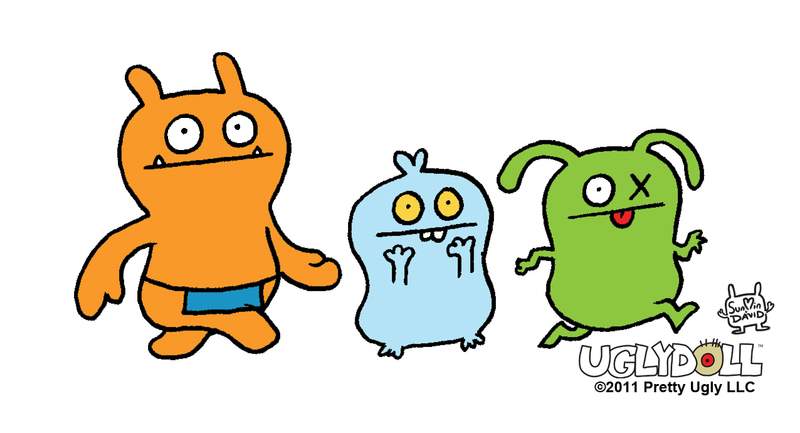 Universal Pictures and Illumination will develop the film based on the global line of Uglydoll characters launched by husband-wife artist team David Horvath and Sun-Min Kim. Meet the Fockers scribe Larry Stuckey will write the script, inspired by the dolls and stories created by Horvath and Kim. See? Now I'm just messing with you, thanks to Photoshop. This is a teaser of one of Justin Hillgrove's custom Mini Kaiju Cupcake figures that he did for the Mini Kaiju Cupcake Custom Blind Box Series. Justin the is man behind Imps and Monsters. More teasers to come. Next up: Nasty Neil! We've provided OpportunityLOL a 7.5-inch Patricio Oliver Beast Rider figure to give away on their site. Click here to go to their review and read details of this giveaway. For up to 3 chances to win this giveaway follow all of the steps below. If chosen by Random.org as the winner please be prepared to email opportunitylol@yahoo.com your name and shipping information. Good luck everyone! "Like" the Opportunity LOL Facebook page and post on the wall/comment on the Beast Rider post. Tweet @OpportunityLOL, @TenaciousToys , and @thetenebrae you want to win! For instance: "I want to win the EPIC Beast Rider by @thetenebrae from @tenacioustoys being given away by @OpportunityLOL" A bit of a tongue twister, but it works! Join the Opportunity LOL e-mail list! If you join the email list you will receive an entry into ALL giveaways done on Opp LOL from now on and will receive an e-mail when future giveaways occur so you can find out the item you may win + enter additional ways. We have a great project in the works in collaboration with Rampage Toys: a blind-box Mini Kaiju Cupcake series! Featuring 5 artists, this 25-piece series is based on the 2-inch Mini Kapukeeki Kaiju resin figure designed and casted by Jon Malmstedt of Rampage Toys! Each artist is contributing 5 hand-painted Mini Kaiju Cupcake figures. Blind boxes will cost $35 apiece and there will be a Golden Ticket randomly inserted into one of the boxes which will get the recipient a 5x7 inch original art piece by Rampage Toys. Top picture is a WIP shot of Jon Malmstedt's pieces. More teasers to follow in upcoming days! Release date to be announced soon. Below are the pieces Jon executed for the TAG show which inspired his design for these minis. "BAGGAGE & FREEDOM" by D. Ross "scribe"
Gallery1988: Melrose is proud to present "Baggage & Freedom," a solo exhibit from Kansas City artist D. Ross, better known as "Scribe." This Thursday, May 26th, from 7-10 PM, come celebrate with the artist, as G1988 unveils the paintings and sculptures of one of the most sought after vinyl artists working today. 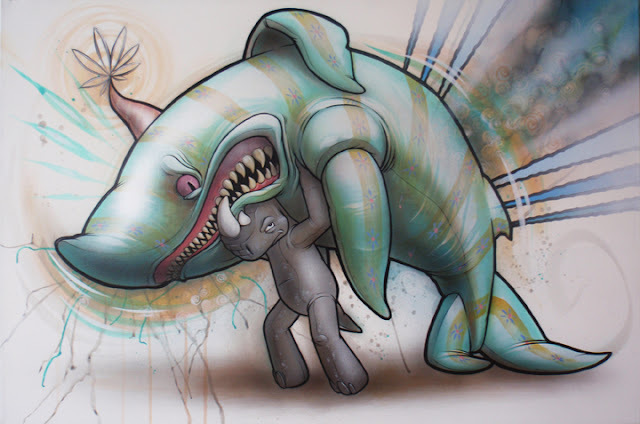 Enter Scribe's signature world of playful animals and graffiti, with his most extensive body of work to date. 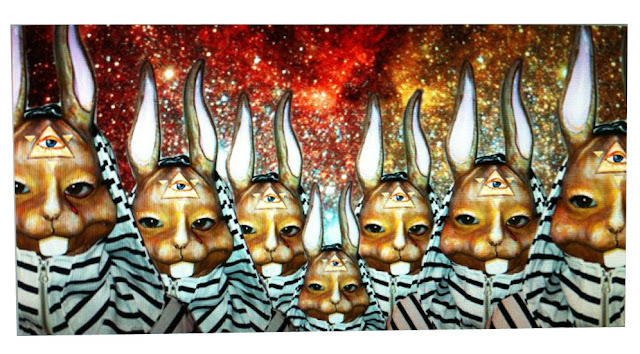 The gallery will also have a limited time installation from Scribe, so make sure to come to the opening to see it! This show will run through July 1st. Stay tuned to the Gallery1988 blog for more details.